The Cantor Morris Levinson collection consists of 28 pamphlets relating to Israel and the 1967 Arab-Israeli War. Also known as the Six Day War, the 1967 Arab-Israeli War was fought between Israel and the Arab states of Egypt, Jordan, and Syria. It resulted in the capture of new territories for Israel: the Sinai Peninsula, the Golan Heights, the Gaza Strip, and the West Bank of the Jordan River, which have proven to be strategically important and hotly contested. The collection is small, but represents a number of voices and attitudes toward Israel in that tumultuous period, with the majority of the collection dating from 1967-1969. Many of the pamphlets, such as Julius Stone’s legal analysis of the conflict “No Peace—No War in the Middle East: Legal Problems of the First Year,” address the legal and political implications of the war. Others, such as “Christian Churches in Israel: Recent Developments in the Relations between the State of Israel and the Christian Churches” focus on interfaith relations. For a full list of the pamphlets, visit our research guide for the collection. 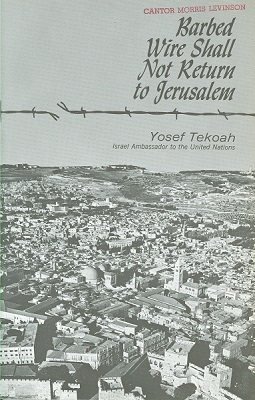 This pamphlet contains excerpts from the addresses delivered before the Security Council on the subject of Jerusalem. The Msgr. John M. Oesterreicher papers: John M. Oesterreicher founded the Institute of Judeo-Christian studies at Seton Hall. His collection contains extensive subject files relating to Israel. The Sister Rose Thering papers: Sister Rose Thering was a professor in the Judeo-Christian studies program at Seton Hall, and an activist for Jewish-Christian relations throughout her life. Her collection contains a series on interfaith and international relations, which includes letters of protest that she wrote to the United States government regarding their policies on Israel. The Nancy Forsberg papers: Nancy Forsberg was an educator and a reverend at First Congregational Church in Union, NJ. She was a strong advocate for interfaith cooperation, and gave many lectures on the Middle East, Israel, and Jewish-Christian relations. Her collection includes subject files on Israel and interfaith topics. The collection is available for research in the Archives and Special Collections Reading Room, open 9am-5pm, Monday-Friday. To make an appointment, contact 973-761-9476 or archives@shu.edu.